I was rummaging through the kitchen trying to come up with a new and different way to cook some cod, and I came across a can of coconut milk. I thought, “Mmm, cod in coconut broth,” and found a recipe for cod with a lemongrass-curry broth that wasn’t too complicated. I have a jar of dried lemongrass from Penzey’s that I keep forgetting about, and I thought this would be a good way to try it out, along with some of their sweet curry powder. I steamed some broccoli, cooked some rice, and served it all up in a bowl together. I cut the recipe in half so it wouldn’t overwhelm our fish; it wasn’t that hard to make, and we all thought it tasted great. Now my husband has started bringing home chicken and looking at me expectantly because I have demonstrated an ability to make yummy curry without Curry Simple. 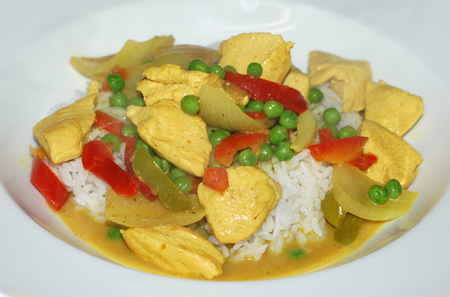 Unfortunately, using a full batch of the same curry sauce on chicken somehow yielded an incredibly bland plate of food, so it was back to the drawing board. I tried again using salmon, sweet potatoes and jarred red curry paste; the flavors were good, but the heat in that curry just about blew the roof of my mouth off. 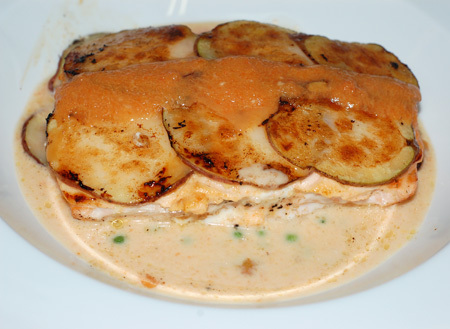 More recently I tried out a red curry-carrot sauce with potato-crusted salmon, using a fractional amount of the same red curry paste; it was still so spicy that I threw out half of it and cut the remainder liberally with coconut milk. So this curry thing is still clearly a work in progress… to be continued. To make the broth, melt the butter in a small sauté pan or wok over medium heat. Add the shallots, garlic, lemongrass, lemon zest, ginger, and curry and sweat until tender and with no color, about 5 to 6 minutes. Add the chicken stock and bring to a boil. Lower the heat simmer for 15 minutes. Add the coconut milk and simmer for 5 minutes. Season to taste with salt and pepper. Strain through a fine chinois and set aside. Place the skillet over high heat until oil is just smoking. Season the cod on both sides with salt and pepper; place in skillet and sauté until golden brown and crusted on the bottom, about 2 1/2 minutes. Turn and sear on the other side for 30 seconds. Put the pan in the oven and roast until a metal skewer can be easily inserted into the fish and, when left in the fish for 5 seconds, feels hot when touched to your lip, about 6 to 7 minutes. To serve, finish the sauce with lime juice. 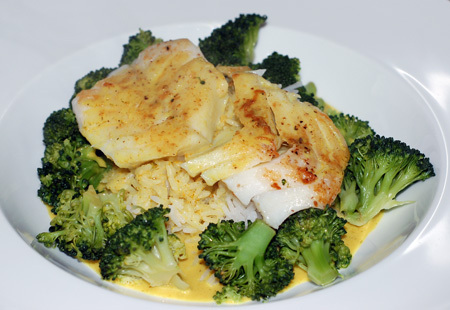 In each bowl, place a piece of cod; pour the sauce over the cod and serve immediately. Source: Slightly adapted from Epicurious.